Great for dipping. Gently cooked to perfection. 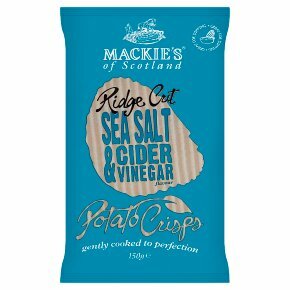 Suitable for vegetarians & vegans.Mackie's thick cut potato crisps are made in Perthshire, Scotland by our award winning family business, Mackie's at Taypack. We use the best varieties of crisping potatoes and carefully selected seasonings, and we never add any artificial colours or flavourings. Our unique gentle cooking method ensures a great crunch, fresh potato taste and dry texture.